Quiara Alegria Hudes’ Pulitzer Prize-winning play “Water By The Spoonful,” just opened at the Mark Taper Forum, continues the legacy of her “Elliot: A Soldier’s Fugue”, now at the Kirk Douglas Theatre in Culver City. Elliott, honorably discharged from the Marines after being wounded in Iraq, has lost the woman who raised him to cancer – the woman he considers his mother – works a minimum wage job, and is haunted by the image of an Iraqi man uttering a phrase in Arabic. This is where we begin. Elliot’s search for family connection, those family members’ search for roots or redemption, and the wider circle of people who influence those yearnings provide the story of this play. Clues to these people’s vital, and sometimes vitriolic, interconnectedness build gradually, and often painfully, in ways defined as much by the performers as by the script itself. Director Lileana Blain-Cruz has her focus on their elemental isolation, and the devastating effect of the lost or sacrificed links to humanness. Sean Carvajal plays Elliot as far more of a street kid than his counterpart at the Douglas – reactionary and emotional, and more youthful (which is odd, as it takes place a few years after the previous play). Still, it works as a contrast to the cousin who is also his closest friend. Keren Lugo’s Yazmin – an adjunct professor desperate to keep family traditions and connections – uses a scholarly calm to balance Elliott’s passionate intensity in ways which obviously set her up as the new family core, now that her favorite aunt is gone. Nick Massouh provides the definition for the terrors Elliott can’t move past, as both the ghost of his dreams and the professor who translates the Arabic phrase the ghost repeats throughout the play. Running a concurrent, then intertwined narrative with Elliott’s, Luna Lauren Velez makes understated work of Odessa, another aunt of Yazmin’s, and the web mistress of a chat site for recovering meth addicts. It works in a low-key way which heightens the tremendous angst at the play’s close. As another recovering addict on the site, Orangutan, Sylvia Kwan’s immaturity and conflict balance well against Chutes&Ladders, played by Bernard K. Addison as the calming, if overly self-protective member of the group. As Fountainhead, the overblown nom de plume for the newest list member – a man still in denial of his powerful need for crack – Josh Braaten is awkwardly pompous, a trick in part of the script but greatly a matter of manner. This makes him difficult for the onstage group and the audience to connect to, which is, of course, the point. Director Lileana Blain-Cruz has splayed these personalities across Adam Rigg’s broad and eclectic set. It works for the most part, until the last scenes, when the introduction of a bathtub seems disconnected from any of the spaces one has encountered, making it somewhat inexplicable. Still, in the end, what one comes away with in this version of this production is almost a voyeuristic sense of watching train wrecks happen in slow motion. Secrets spew, fears capture, sorrows are huge, and disconnects are potent. That this is, indeed, a portrait of America (hence the Pulitzer Prize) says a great deal about the actual American experience. That this portrait is as recognizable as it is speaks to the undercurrent of our national identity in a way which is tragic, human and very real. What happens when a young man joins the service as his father and grandfather before him did? Over the course of our national narrative, particularly over the last century, this has been a recognized, even celebrated legacy. Bring it up to modern times, however, and modern sensibilities, and what is this legacy actually doing? How does the enormous irregularity of Vietnam play into that framework? “Elliot: A Soldier’s Fugue,” the first in a trilogy by Tony and Pulitzer Prize-winning playwright Quiara Alegria Hudes, examines this and more as it balances three generations of a Puerto Rican family’s struggle with just that legacy. Now at the Kirk Douglas Theatre in Culver City, the play examines what these men carry with them, what they cannot tell, how they coped, what that cost, then balances that against their innate love of the natural beauty found in an island which remains a nation within the larger nation they fight for. Elliot is young Marine back from the invasion of Iraq to recover from wounds suffered there. He enlisted without telling his family, but proud of the fact his father and grandfather had also served. His father, Pop, never talks about Vietnam, though he met Elliot’s mother – a nurse in an evac hospital – during his own recovery from wounds. His grandfather suffered through the winters in Korea, keeping his fellow combatants’ spirits up by playing Bach on his flute. We watch an interplay – a fugue – of all four people’s experiences, both in combat and in coping with the after-effects of what they cannot fully explain. In this mix, what will Elliot do, as he struggles to define the older men’s understanding, and prepare himself for a return to the front? Peter Mendoza fills Elliot with the optimism of youth, and a quiet version of curiosity about how his own understandings stack up against those of the older men who will not share experiences with him. Jason Manuel Olazabal moves like a man with something twisting inside as he relives the nameless threats which balance against and overwhelm humane moments of soldiering, the scarring effects of Vietnam. Ruben Garfias handles the switches from aged grandfather declining into dementia to young soldier struggling to play a flute with frostbit fingers – the inner memories which may not surface. All turn wistful when thinking of the lush greenery of Puerto Rico, and their sense of community there even when returning after long absence. In this they echo Caro Zeller’s former nurse, pulled into a sense of life by tending a random, junglesque garden in the midst of New York. That constant juxtaposition of verdant life with the consistent experience of death and horror which constitutes military action forms another fugue within the play. Director Shishir Kurup has used Sibyl Wickersheimer’s seemingly simple photo panel set to create a sense of generational link and disconnect as one floats from the present to the past to the present again while the stories intertwine. The focus on the fragility of each of these characters, even as each of them pull themselves up to move forward, underscores the needed message this play has for the world. Depending on who one empathizes with, this can be read – as most fugues can – more than one way. “Elliot: A Soldier’s Fugue” is the first in Hudes’ “Elliot Trilogy,” which are all being performed in Los Angeles in overlapping productions – the first time any city has hosted all three at once. Next on the list is “Water By the Spoonful” at the Mark Taper Forum. When the musical “In the Heights” by Lin-Manuel Miranda and Quiara Alegria Hudes, hit Broadway in 2008, the excitement it created came from two angles. First, it celebrated the sense of neighborhood and the stresses of change in the largely Latino barrios of New York itself. But on a larger scale, it used contemporary hip-hop and Latino musical forms to celebrate the elemental life force of similar barrio neighborhoods from the Bronx to Huntington Park, and the threats posed to their close-knit fabric by the forces of gentrification. As such it contained a universality which, when combined with the high energy music born from salsa and marenge, became identifiable across cultures and geographic location. Now this lively, heart-filled musical has opened in a finely polished production at Claremont’s Candlelight Pavilion Dinner Theater. With sharp, live percussion, a talented, focused and ensemble cast, and a message everyone can connect to, the show is a sure-fire hit. The story looks at one block in a low-rent section of New York City. There, Usnavi works the corner bodega left him by his father, and along with his young cousin Sonny provides basic services, and a community center for the rest of the neighborhood. That community includes the Rosarios, owners of a car service and proud parents of Nina, the daughter whose departure for Stanford has become a symbol of “getting out.” Nina’s return brings its own issues, particularly in relation to her interest in Benny, a Rosario employee her parents think of as beneath her. Also part of the community are Daniella, owner of the hair salon she’s soon to close and move thanks to rent hikes, and her two employees, Carla and especially Vanessa – the girl Usnavi is trying to get up the nerve to ask out. These, a young artistic tagger known as Graffiti Pete, an ambitious seller of fruit-flavored ices known as the Piragua Guy, and a joyously various ensemble of singer-dancers round out the extended family of neighbors. At the heart of all of it is the aging Cuban woman who acts as everyone’s grandmother, Abuela Claudia. A hot summer, a city-wide blackout, rising personal and communal tensions, and news someone from the Bodega has a winning lottery ticket all combine to create a very recognizable drama, filled with humor, pathos, and all that lively music. 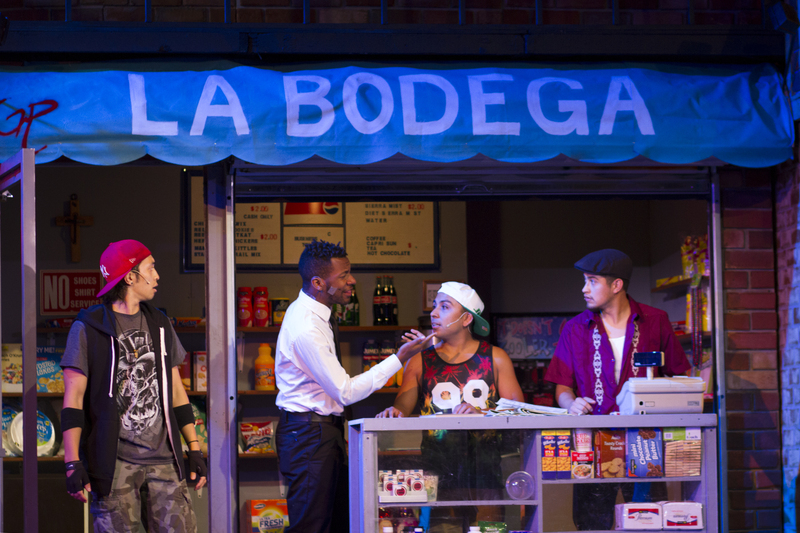 Ruben J. Carbajal proves articulate and deeply committed as Usnavi, providing the glue which holds the show together. Ruben Bravo and Chris Marcos as Sonny and Graffiti Pete vibrate with the energy of youth – kids with hip-hop roots and big hearts. Anyssa Navarro brings to the torn and somewhat desperate Nina a sense of the weight which comes with carrying the dreams of an entire neighborhood on your shoulders, while Revel Day provides a subtle sense of the outsider looking in as Benny. Dominique Paton shimmers as the troubled but ambitious Vanessa, Orlando Montes as Nina’s introvertedly angry father, and Jackie Lorenzo Cox as her disappointed, practical mother provide a balance of truly adult forces in the mostly youthful tale. Candida Celaya cements all these characters and more together with a subtle power as the fragile Abuela. Indeed, everyone in the cast is right on point, providing one of the most evenly fine ensembles Candlelight Pavilion has had in many years. But the excellence doesn’t stop there. Director Benjamin Perez uses the small stage as if it was a full city street, and takes the audience there with him. Marissa Herrera’s energetic and organic choreography becomes a physical celebration all its own. Anna Louizos Designs’ adaptation of the original Broadway set continues this polish, as do Karen Fix Curry’s costumes and even Mary Warde’s extremely convincing wigs. The best of this production comes from the melding of all the theatrical elements into a seamless whole. The story is captivating, the music, though not wildly hummable afterward, proves apt for the story and as organic as the dance. The tech is solid, enhancing the whole. The deep love for the genuine, rounded people being portrayed and their individual and communal struggles is evident throughout. This is a story centered on a strong sense of character – all the characters – and their sense of place. The secondary joy of any Candlelight Pavilion performance is that it comes with dinner. Make this your night on the town. 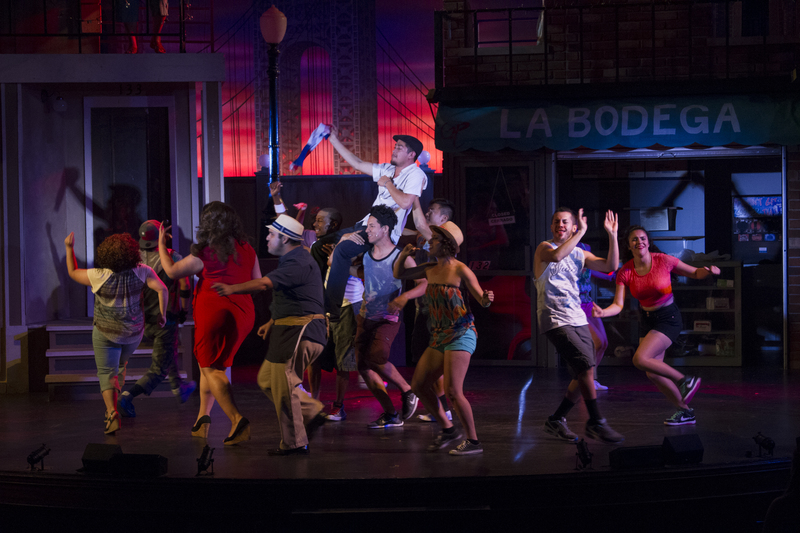 “In the Heights” will offer up surprises for those who like their musicals more standard, but the surprises will be pleasant ones.